HEIDENHAIN ERN, ECN and EQN rotary encoders with integral bearing and mounted stator coupling are characterized by simple mounting and short overall length. Possible applications range from simple measuring tasks to position and speed control on servo drives. The hollow shaft of these encoders is slid directly onto and fastened to the shaft to be measured. ROD, ROC and ROQ rotary encoders from HEIDENHAIN have their own bearings and are sealed. They are robust and compact. These encoders are coupled by the rotor to the measured shaft through a separate coupling that compensates axial motion and misalignment between the encoder shaft and measured shaft. 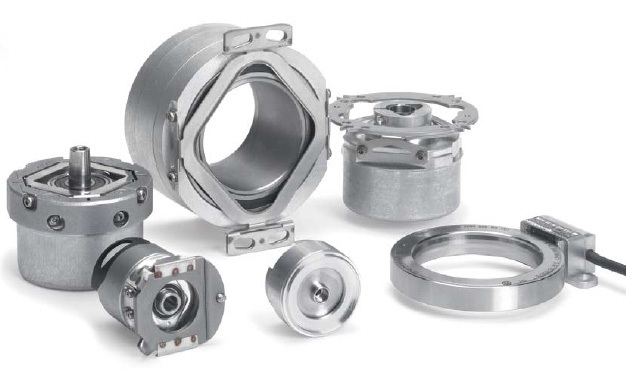 The inductive rotary encoders ECI/EQI 1300 are mechanically compatible with the photoelectric encoders ExN 1300: the shaft is fastened with a central screw. The stator of the encoder is clamped by an axially tightened screw in the location hole. The photoelectric ERO modular rotary encoders from HEIDENHAIN consists of a graduated disk with hub and a scanning unit. They are particularly well suited for limited installation space or for applications for which there must be no friction.